【FAST DRYING】: Microfiber towel, material absorbs humidity. 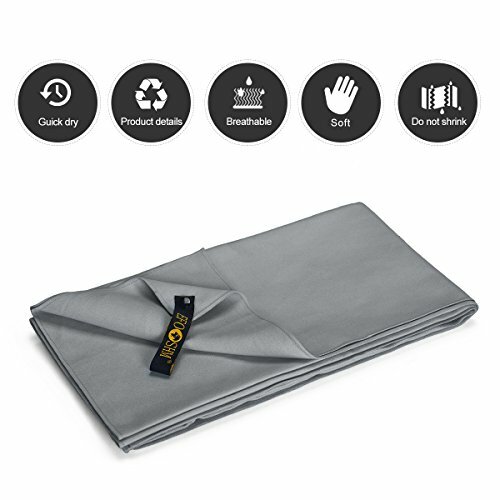 It drying up much faster than ordinary cotton towels, can absorb tons of water, this towel is much comfortable for next use & convenient to pack. 【SOFT SKIN FEELING】: Pleasant to touch anti bacterial microfiber gym towel absorbs liquids as well as a high-quality fluffy terry towel does, but it is much lighter and more compact. 【ULTRA COMPACT & LIGHT WEIGHT】:Fabric made from 80% polyester / 20% polyamide mix, making microfiber lightweight, compact & quick drying. This towel won't be taking up valuable bag space. 【SUITABLE FOR】: An ideal option for traveling, training in the gym, yoga, fitness, running, bicycling, swimming, camping, hiking or driving. 【SIZE】: Large 47" X 27"inch - Large towel for the gym or fitness, adult swimming or beach towel. TIPS: Please wash your towel before first use. it'll explore the wonderful world with you.